Every Other Thursday, you’ll get this short, fun, relevant newsletter. It will contain a quote or smile about the library and those who love it, an idea you can use to promote your library or reading in general, a Common Core implementation idea and a shameless plug for the programs I offer. Enjoy! 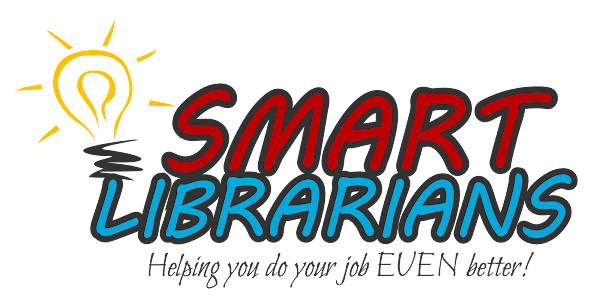 If you are new to EOT or have missed any previous issues, you can read them all at www.smartlibrarians.com. And please tell your friends about it! For a total of 3,141 items! This is a 17% increase over last year! If you can’t spend the money on a permanent sign, print it out on a brightly colored piece of paper and post it near the door! People need to see what the media center is doing and how valuable it is! Last week I discussed getting grants and have heard from a few of you that you have applied. Way to go! Here is a BONUS MONEY IDEA – If your Partners in Education are under-utilized, get permission to ask them for a contribution for books or equipment. Businesses become business partners so they can help. Not using them is a wasted opportunity. Think what you could do with four $250 donations! The Developmental Studies Center (www.devstu.org) has a wealth of Common Core resources, including a Tip Of The Week (TOTW) section. Explore the site and find resources, ideas and answers for your teachers (and your media center program!). CCSS.ELA-Literacy.W.K.1 - This standard reads: Use a combination of drawing, dictating, and writing to compose opinion pieces in which they tell a reader the topic or the name of the book they are writing about and state an opinion or preference about the topic or book (e.g., My favorite book is…). The following activity is based on one of the new supplemental activities available to our program users on our website. While the activity was written for Kindergarten, I think it could easily be adapted across the grades, using the continuum of learning outlined in the standards for each grade level. It’s also one that can be repeated several times throughout the year. Let me know how I can help! See you in two weeks! Money – there’s never enough. Here’s help! 24. Collect Box Tops for Education and Labels for Education and use funds for media center needs. Have a couple of label drives each year and reward classes that collect the most. My wife’s school collected over $1150 in BTFE and got equipment for the school using LFE. Get a volunteer to collect, sort, tally and turn in the labels. You do NOT have to do this yourself. 25. Grants. Two grants for libraries that are worth looking into are the Target grants for reading (look here for more info) and the Dollar General Grants (click here). When I was a student, I ALWAYS passed vocabulary tests with great grades, but almost never added words I learned to my “working vocabulary.” It was not until about the 6th grade that I had a teacher who encouraged actually USING the words we learned in conversation that I began to integrate new vocabulary words into life. One goal of Common Core is to lead students to make new vocabulary “second nature.” This article gives 11 tips for doing just that. You can reward your readers with stuff or with experiences. One way to give students an unforgettable experience that encourages them to read is to schedule an assembly visit from Tommy Johns Presents! Take a look at www.tommyjohnspresents.com and discover which of the eight programs offered will fit your needs best.